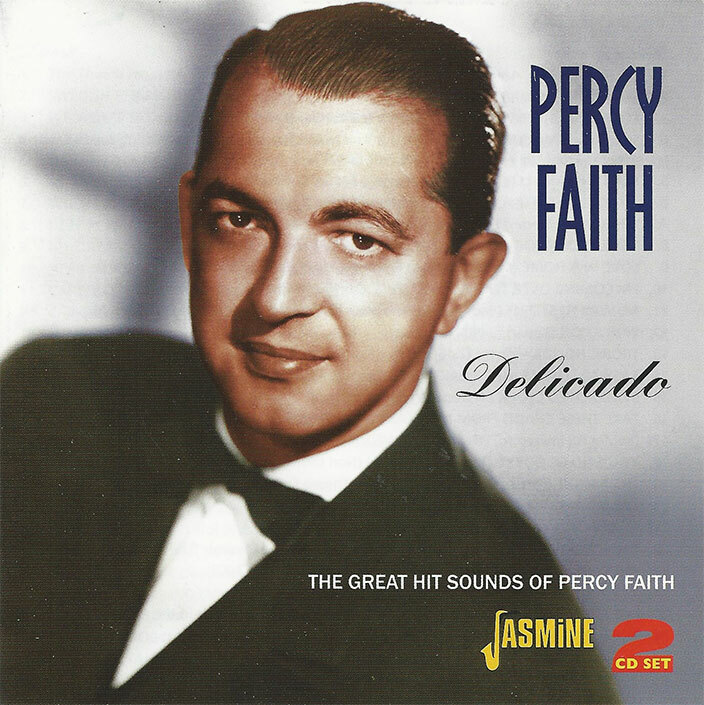 Percy Faith was one of several arranger-conductors of the 1950s and 1960s who is credited with popularizing “Mood Music” – a powerful force in FM radio and record album sales for nearly two decades. His approach was to soften the popular brass and woodwinds of the big band sounds with large string sections, and occasionally, a choral interweaving with special emphasis on the treble voices. Percy Faith was born and raised in Toronto, Ontario, Canada. As a youth, he was a gifted pianist and violinist, but when he was badly burned in a fire, his focus changed to arranging and conducting. He established a distinguished career in Canadian broadcasting prior to his move to the United States in the 1940s. His first American recording sessions were for Decca, but by 1949, he had moved to RCA Victor where he recorded several tracks, including Deep Purple, Jimmy Dorsey’s Oodles of Noodles, and two releases featuring The Ray Charles Singers: My Dream Concerto and the haunting Whirlwind. In 1950, Percy Faith began a long-term association with Columbia Records, providing rich and vibrant support to the recordings of such artists as Sarah Vaughan, Jerry Vale, Doris Day, Frankie Laine, Jill Corey, Tony Bennett, Toni Arden, Johnnie Ray, Frank Sinatra, Rosemary Clooney, and Johnny Mathis. Represented within this set are his sessions with Marion Marlowe, Champ Butler, Felicia Sanders, and Gospel singer, Mahalia Jackson. For more than a decade, Percy Faith issued many major hit singles that scored high on both the Billboard and Cash Box charts. He was one of the first to record Christmas In Killarney and Sleigh Ride for the 1950 Christmas season. The success of this release was likely the incentive for later recording several Christmas album collections, all of which have been reissued on LP, cassette tape, and CD. Leroy Anderson’s Syncopated Clock was a pop favorite in 1951; but Faith literally hit gold in 1952 with the dramatic Delicado, featuring harpsichordist Stan Freeman. (Lyrics were soon added to this instrumental, and RCA Victor followed with a recording by Dinah Shore.) The following year, The Song From “Moulin Rouge” (Where Is Your Heart) soard to the top of the charts where it held the #1 position for ten weeks. The Swedish Rhapsody (the B side) also achieved great recognition and is regarded by fans as being one of his very best. Many Times was a major hit in 1953, with releases by both Percy Faith and Eddie Fisher. Faith’s last mega hit was another film favorite, The Theme From “A Summer Place,” which remained at the top of the Billboard charts for nine weeks. Beginning in 1953 and continuing until his death in 1976, Columbia Records issued more than eighty Percy Faith collections. Throughout an association that spanned more than twenty-five years, his highly diversified albums were reflected in their titles: Continental Music, Music From Hollywood, The Most Happy Fella, My Fair Lady, Li’l Abner, Hallelujah!, Porgy and Bess, The Sound of Music, Exotic Strings, Great Folk Themes, The Beatles Album, Angel of the Morning, Jesus Christ, Superstar, Country Bouquet. In 1956, Columbia Records issued the LP Passport to Romance. One of the tracks – Little Lost Dog – captured the attention of broadcaster Ted Strasser at WJR in Detroit, who was about to assume the leadership from Larry Jones of the Sunday morning program, “Patterns In Music.” The introduction of this track was used as the opening and closing of each segment of this four-hour program, becoming one of the most popular and requested themes in WJR’s history. By 2002, Mike Whorf had taken over as the program’s fifth host, and when he retired in 2005 and the station cancelled the weekly musical “journey,” the same popular Percy Faith theme was still being used. Percy Faith has left a great legacy in a wealth of recordings encompassing more than thirty years of a brilliant career. Felicia Sanders (born Felice Schwartz in Mount Vernon, New York) was a featured night club and radio singer prior to being brought to the attention of Mitch Miller in the early 1950s. According to a Canadian DJ at CKLW in 1954, The Song From “Moulin Rouge” was to be Jerry Vale’s breakthrough hit record, but because Vale was having problems with laryngitis during the date of the scheduled recording session, a change of direction became necessary. Miller decided that the track would be primarily Percy Faith’s instrumental, with a vocal added about one-third of the way into the recording. Felicia Sanders, who was not yet officially signed to the label, was brought to the studio and was paid only union scale for one of the best-selling records of 1953.With a new Columbia recording contact, she later recorded the sensitive Wanting and Loving, with Faith conducting, and Blue Star, the theme from the popular television series, “Medic.” In 1957, Sanders was the first to record Meredith Willson’s Goodnight, My Someone from “The Music Man” shortly after leaving Columbia and signing with Decca. In 1950, Mitch Miller left Chicago-based Mercury Records to accept an executive position with Columbia Records, creating a dramatic transformation within the company. He initiated the signing of several new entertainers, including The Four Lads, Jerry Vale, Rosemary Clooney, Johnnie Ray, Tony Bennett, and St. Louis-born Champ Butler, who remained with the label until 1955. Among Butler’s most successful single releases were his 1951 recordings, I Apologize and the exuberant Down Yonder. He later recorded some very memorable tracks with Percy Faith, including Be Anything (But Be Mine), Take These Chains From My Heart, and I’m Walking Behind You, a major hit song that secured the #1 position on Billboard for seven weeks. Butler’s later recordings recordings were issued by Coral and Dot. Mahalia Jackson was already a seasoned worldwide performer by the time she signed with Columbia Records in 1954. Known as The World’s Greatest Gospel Singer, her early years were devoted to singing in churches, but as her fame increased, she was welcomed enthusiastically in major concert halls. She declined lucrative offers to perform in Las Vegas because she would not sing where alcohol was server. Her recordings for Apollo were best-sellers, which included Move On Up A Little Higher, which reportedly sold more than eight million copies. Her Columbia albums were especially popular, and her single releases included A Rusty Old Halo, One God, The Lord Is a Busy Man, Mary’s Little Boy Chile, The Bible Tells Me So, He’s Got the Whole World in His Hands, and For My Good Fortune. She preferred recording with an ensemble of instrumentalists (frequently, The Falls-Jones Ensemble), but by the late ‘50s, was persuaded to record the album “The Power and the Glory” with Percy Faith conducting, one of the most dynamic projects of her illustrious career. She and Faith also recorded Away in a Manger, which was not part of this release. Jackson was a welcomed guest at The White House where she was invited to perform for President and Mrs. Dwight Eisenhower, and later traveled to India for a performance before thousands which included Prime Minister Indira Gandhi. Missouri-born soprano, Marion Marlowe, secured a recording contract with Columbia Records soon after Arthur Godfrey added her to the roster of singers of his highly-rated radio and television programs on CBS. She quickly became popular with her show tunes, operetta favorites, and recordings, and If You Love Me (Really Love Me) became a Top Ten hit song in 1954. Upon leaving Godfrey and Columbia the following year, Marion signed with Archie Bleyer’s Cadence Records and released The Man in the Raincoat, the best selling recording of her career. In 1959, she co-starred with Mary Martin and Theodore Bikel in the original Broadway production of Rodgers and Hammerstein’s “The Sound of Music.” Several of her recordings, including her 1954 hit, Whither Thou Goest, are part of Jasmin’s two-CD celebration: “Arthur Godfrey and His Friends” (JASCD 146). Special Thanks: Mike Whorf, Sandra Johnson, Graeme Freeland, Ray Lord, Val Shively. Cash Box Pop Singles Charts 1950-1993 by Pat Downey, George Albers, and Frank Hoffmann, Published by Pat Downey Enterprises, Boulder, Colorado 80307, USA, Copyright 1994. Pop Memories 1890-1954: The History of American Popular Music by Joel Whitburn, Published by Record Research Inc., Menomonee Falls, Wisconsin 53051, USA, Copyright 1986.